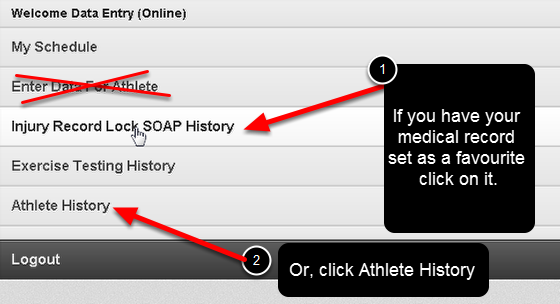 #1: If you have your Medical/Injury Record set up as a favourite on your accounts page (e.g it appears as an opened record at the top of your Sidebar on the main system and as a button on the main home page), it will appear for you to click on to go directly to the athlete history for this Event Form. All of the records for the Event Form and the Athlete will be displayed. 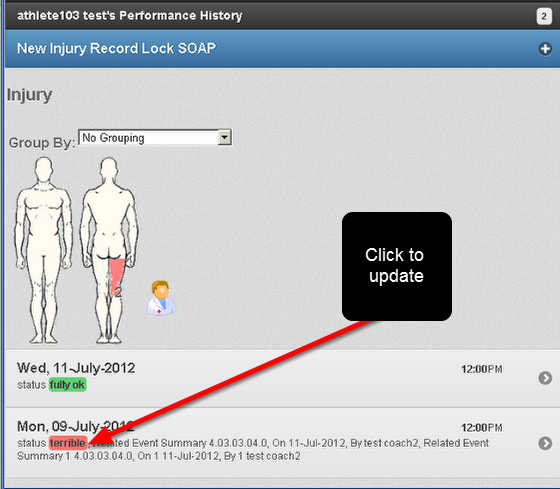 The example here shows that the older injury is marked as red, this is the one you would click on to open. 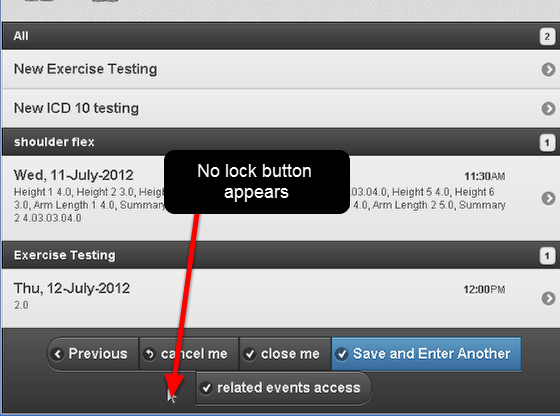 Once opened, you can then add in notes or update the athlete's status. Depending on how your system is set up you may need to update a SOAP table, or enter in a return to play/ training date. To get to the correct field or section you will probably need to move through multiple Sections in the Form by clicking "Next"
To get to the appropriate field in the Form, or to get to your SOAP notes table*, you will need to click Next to move through the Form's sections. *Please be aware that SOAP notes (or any data in a table) appear in a section on their OWN. The "table" does not display with columns, instead it displays with the date of entry and then a summary of the data entered for that SOAP row appears underneath the date. When you view the record on the main system it will display in a table view. 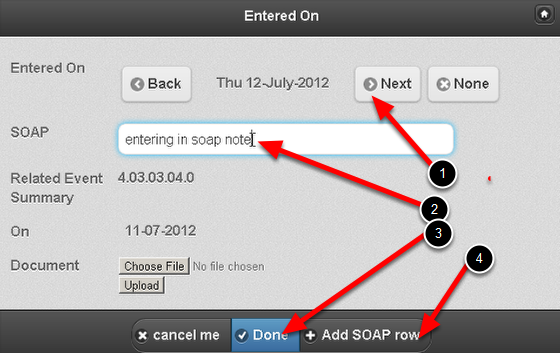 #4: Click on Add SOAP row to add in an ANOTHER row to the table in addition to the one you are currently creating. N.B. Cancel will quit out of the SOAP row and it will not be created. 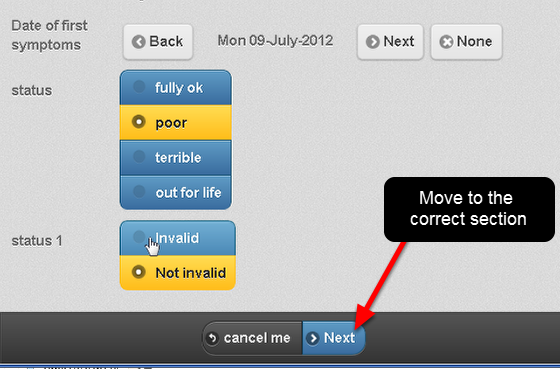 Move through the form and update any other fields that are necessary. N.B. This record has Related Events set up for it. These appear BEFORE the save and close/save and lock buttons on the Mobile version. 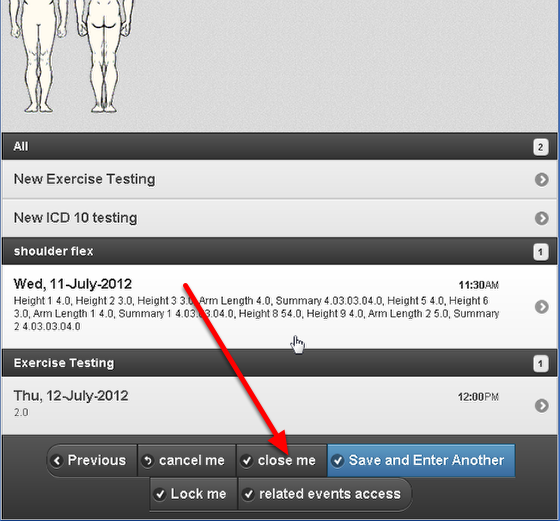 On the main system most Medical records are set up with the Related Events and Related Events data appearing below the Save and Close buttons. However, it is not possible to set the system up this way on the iPad/iPhone system so they appear above the save and close buttons. The lock button does not appear for selection unless specific lock criteria are met. This will be the same as on your main system. 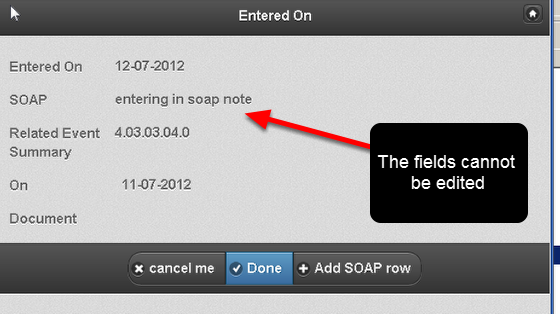 The SOAP note row locking delay will be the same on the Mobile version as on the main internet and desktop versions. If you have any queries or concerns about using the Athlete History button to update existing medical records, please contact your distributor/administrator immediately.